President Obama believes climate change is “a critical, urgent national security issue for our country,” Secretary of State John Kerry told NBC’s Chuck Todd during the Paris conference. At a COP-21 side event with The New York Times’ Thomas Friedman, Secretary of State Kerry called the climate-related drought in Syria a “clearly destabilizing” factor that “absolutely” contributed to that country’s upheaval. As this demonstrates, the connections between climate change and instability are complex, multifaceted, and always mediated by other pressures. A COP-21 side event at the German Pavilion, organized by the German Federal Foreign Office, highlighted the results of A New Climate for Peace, a report commissioned by the G7 Foreign Ministers and recently published by a consortium including the Wilson Center. In the report, we identified seven compound climate-fragility risks: local resource competition; livelihood insecurity and migration; extreme weather events; volatile food prices and provision; transboundary water management; sea-level rise and coastal degradation; and the unintended effects of climate policies. Of all of these compound risks, the links between volatile food prices and conflict is one of the most hotly debated and poorly understood. They are of compelling interest to local and national policymakers, but rarely discussed in detail at the international level. Rising Temperatures, Rising Food Insecurity? Clearly, food production, prices, and food security will all be significantly affected by climate change’s impact on temperatures, rainfall, and aquatic species, as outlined by Working Group II of the Intergovernmental Panel on Climate Change in its 5th Assessment report. A report released by International Food Policy Research Institute during the COP predicts that climate change will have an adverse effect on food security in vulnerable countries. It cites the example of the Philippines, where it notes that climate change may increase the number of people at risk of hunger by 1.4 million in 2030 and 2.5 million by 2050. It’s not nearly as clear why and how food security is linked to conflict. The relatively low profile of food-conflict connections in Paris reflects that lack of consensus. How do we begin to untangle the strands of what one former diplomat called the “spaghetti bowl” of food insecurity, climate, and conflict? We can start with more integrated analysis. Task forces and assessments are only the beginning. To truly cut the cords connecting climate change, hunger, and violent conflict, we need to profoundly transform our policies, programs, and attitudes so they reflect the “extraordinarily interconnected” world we live in today. Half a world away from Paris, in the fragile state of Nepal, almost 50 percent of children are malnourished. In the country’s Terai region, more severe and unpredictable monsoons are ruining farmland and changing crop cycles. The Hariyo Ban Project, an innovative partnership between WWF, CARE, and Nepalese NGOs, seeks to improve climate adaptation through a holistic approach that includes not only climate vulnerability assessments, but also empowerment, education, health care, and family planning. Why is Hariyo Ban able to do this, when so many other programs and policies have not? Flexible funding, said Oglethorpe, which allows them to put the needs of the community over the priorities of their funders. Marcy Levy agrees. “Adaptation financing is the only vehicle for making COP-21 relevant to security. It is important that we not squander this opportunity to design climate adaptation financing to do the most possible to help societies steer clear of the climate-triggered humanitarian crises that now plague our world,” he wrote in an email. But just two short weeks later, President Hollande closed the conference with a celebration of peace: “Today it is the most beautiful and the most peaceful revolution that has just been accomplished,” he said. While the agreement is a major accomplishment, the revolution has only just begun. 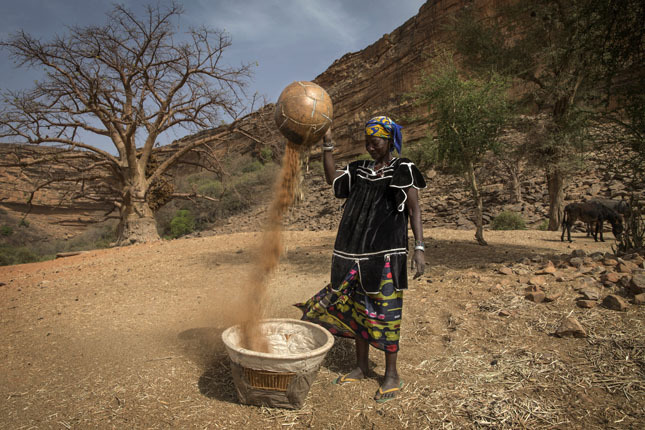 A critical next stage is to integrate climate adaptation, development and humanitarian aid, and peacebuilding efforts, with a strong focus on food security. Only then can we truly limit the risks to the planet we share and the peace we seek. Sources: AP, Adelphi, ClimateWire, European Union Institute for Security Studies, Fast for the Climate, The GroundTruth Project, International Alert, International Food Policy Research Institute, National Intelligence Council, Reddit, Research Program on Climate Change, Agriculture, and Food Security, U.S. Department of State, UN Framework Convention on Climate Change, The White House. 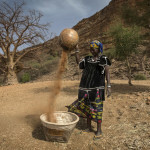 Photo Credit: A Dogon woman winnows millet in central Mali, courtesy of Marco Dormino/UN Photo.